The State Department plans to spend $1,212,000 to send 75 to 100 Cuban teen-agers to the United States "to develop leadership skills and learn about civic participation and community engagement." The teen-agers will remain in the U.S. for three to four weeks as part of the project, called "Summer Leadership Program for Cuban Youth." Participants must be 16 to 18 years old. English proficiency is not required. The program will be conducted in Spanish. The Cuban students will take part in "youth-appropriate leadership activities and workshops in a safe environment, interact with American youth and gain first-hand experience with community engagement." Students will stay with American families for six to eight days during the program "to further introduce the students to American culture." The State Department's Bureau of Western Hemisphere Affairs on May 29 announced that it is looking for a non-governmental organization or an educational institution to run the project. The application deadline is June 30. The program delivery should be primarily interactive activities, practical experiences, and other hands-on opportunities to learn about the fundamentals of a civil society, leadership skills, critical thinking, democratic principles and community service. The activities could include participation in clubs, camps, seminars, workshops, simulations and role-playing, teambuilding exercises, case studies, a volunteer service project, leadership training exercises, meetings, classroom visits, site visits, and social time among peers. Ex-hijacker's fate in hands of "Maximum Mike"
Former fugitive William Potts' case has been reassigned to "Maximum Mike," regarded by some lawyers as one of worst federal judges in Florida. To put it very kindly, this judge is not the sharpest tool in the shed. To put it bluntly, he is a nitwit and a judicial wimp when it comes handling complex civil litigation: this probably explains why he 'overcompensates' by being one of the harsher sentencers in criminal cases. Only one judge in the district, Marcia G. Cooke, scored lower than Moore. Her average score: 4.3. George W. Bush nominated Cooke on Nov. 25, 2003. George H.W. Bush nominated Moore on Oct. 4, 1991. 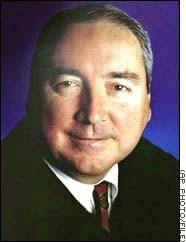 An Obama nominee, Judge Robin S. Rosenbaum, had been assigned to Potts' case. Barack Obama nominated her to the district court on Nov. 30, 2011, and to the U.S. Court of Appeals for the 11th Circuit on Nov. 7, 2013. On May 12, the Senate approved Rosenbaum's nomination to the appeals court and her cases were reassigned to other judges. Potts' sentencing is now set for 10 a.m. July 10 before Moore in Miami. Cuban authorities arrested American development worker Alan Gross in 2009 after his fifth trip to the island to set up a network of Internet hotspots. But Gross evidently wasn’t the only older Jewish man spotted in Cuba carrying out a mission for the U.S. government. Jeffrey Robert Kline, founder of the Self Reliance Foundation, went to the island to test cell phones and other wireless devices for a contractor that was working for the State Department, according to a knowledgeable source who asked not to be identified. Kline could not be reached for comment. In February, I wrote about a Cuba project he is doing for the Broadcasting Board of Governors. (See “The incredible disappearing $450,000 contract”). DAI, an international development company in Bethesda, Md., had hired Gross to travel to Cuba to set up the Internet hotspots. The U.S. Agency for International Development, or USAID, financed DAI as part of a democracy project aimed at undermining Cuba’s socialist government. Kline and other Self Reliance Foundation employees had brought into Cuba some $50,000 worth of communications gear, including at least one satellite phone. Cuban authorities confiscated some of the gear and briefly detained one of the employees. 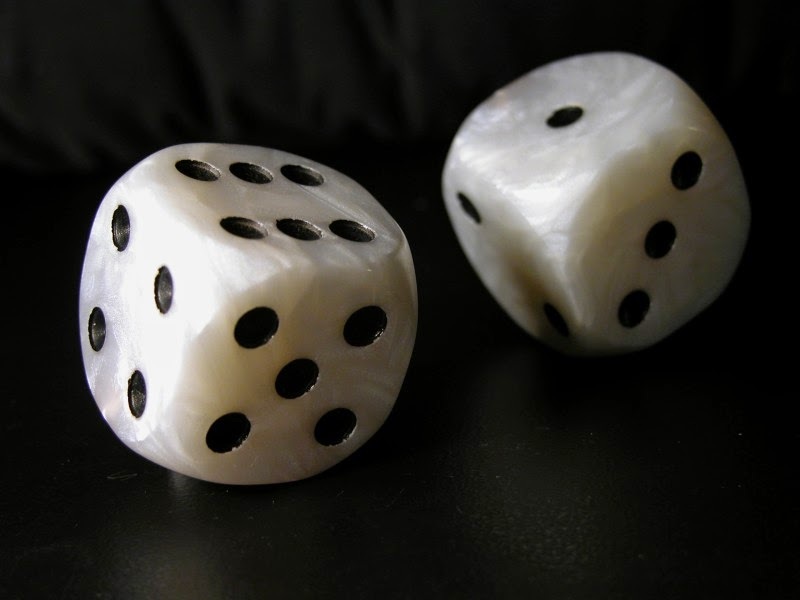 Trading with the "enemy" is a necessity for most visitors to Cuba. Even the U.S. Interests Section in Havana deals with state-run enterprises, pumping hundreds of thousands of dollars into the socialist economy. On March 7, the Interests Section paid a Cuban security firm $70,580 for "transportation/processing of cash." 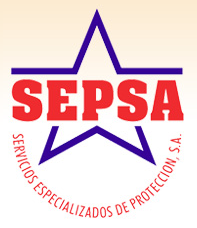 The money went to SEPSA, also known as Servicios Especializados de Protección, S.A.
American diplomats spend money in Cuba every day. While some of the money goes into private hands, some winds up supporting socialist enterprises. 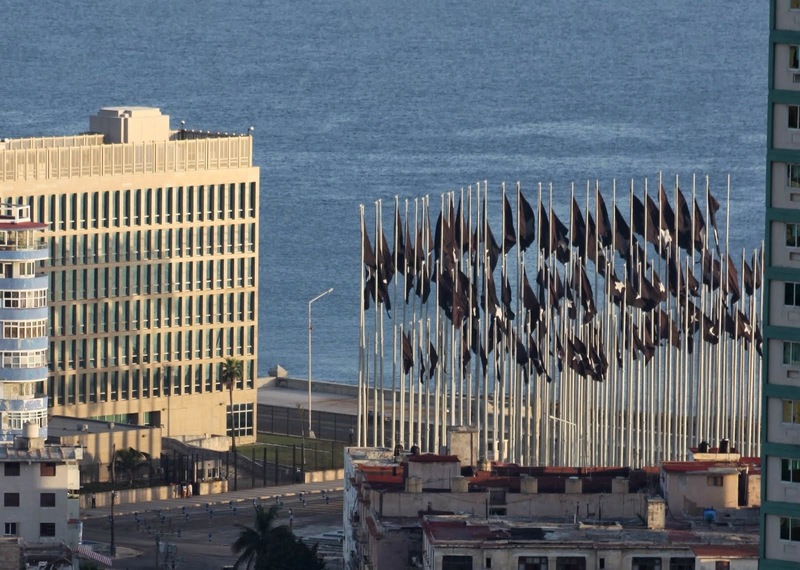 U.S. officials in Havana often have no choice but to deal with Cuba's state-run companies. From October 2012 through April 2014, the Interests Section paid unspecified fuel dealers $336,100, records show. They paid an additional $781,617 to gasoline stations from November 2010 through December 2014. 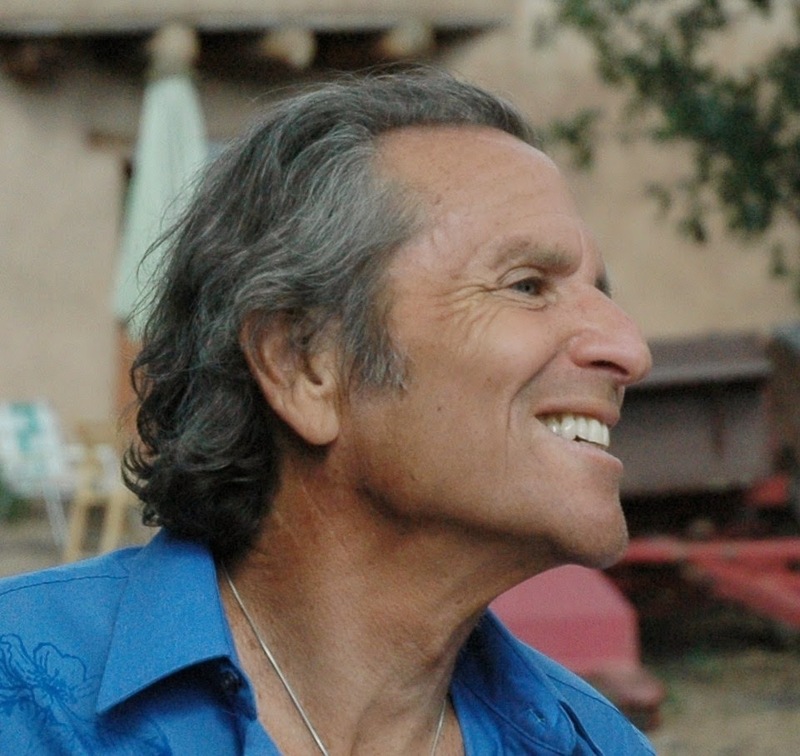 He will return to the United States before his 66th birthday, dead or alive. After years of inaction, I’m imploring President Obama to intervene personally on Alan’s behalf and bring him home to our family. Today marked the fifth birthday USAID contractor Alan Gross has spent in a Cuban prison cell, which has taken a terrible toll on both him and his family. We strongly urge the Obama administration to engage directly with the Cuban government to secure the release of Mr. Gross so he can come home as soon as possible and reunite with his family. Domestic politics should no longer stand in the way of our government acting to bring home one of our own. Ex-hijacker William Potts agreed Thursday to plead guilty to kidnapping as part of a plea bargain with the government. In exchange, prosecutors will dismiss an indictment charging Potts with air piracy. As part of the deal, Potts acknowledged that the judge still may sentence him for up to life in prison for hijacking a plane to Cuba in 1984 (See facts of case). U.S. District Judge Robin Rosenbaum may also fine Potts as much as $10,000 and disregard that he spent more than 13 years in a Cuban prison for the hijacking. Sentencing was set for 10:30 a.m. July 11 in Fort Lauderdale. 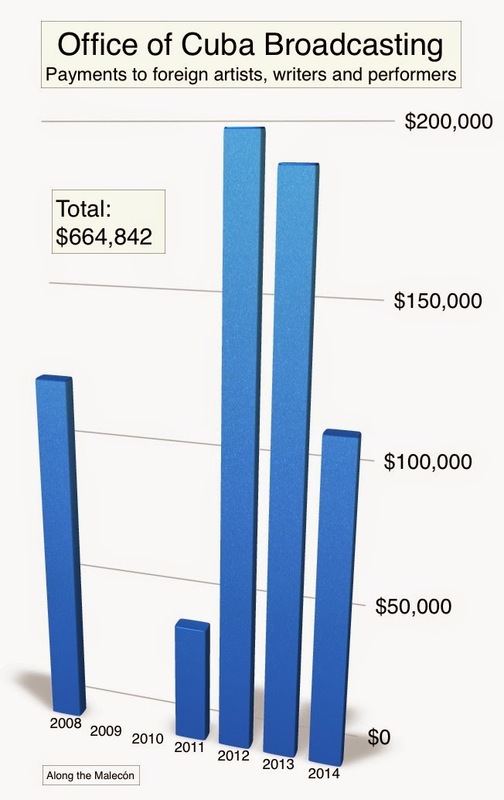 The Office of Cuba Broadcasting in Miami paid $664,842 to "miscellaneous" foreign artists, writers and performers from Jan. 1, 2008 through April 30, 2014. Purchase Order for Enrique Dausa - Stringer from Spain. Prepare a Purchase Order for Felix Loarca Guzman - Stringer from Guatemala. Prepare a Purchase Order for Carlos A. Cabana Cal - Stringer from Argentina. Prepare a Purchase Order for Miguel Cabrera - Stringer from Chile. Purchase Order for Daniel Blumenthal - Stringer from Israel. Purchase Order for Pedro M Clavijo - Stringer from Russia. Prepare a Purchase Order for Maria J Garcia - Stringer from Spain. Purchase Order for Freddy Valverd - Stringer from Ceska Republic. Purchase Order for Aymara Lorenzo - Stringer from Guatemala. A stringer is a freelance journalist, photographer or videographer. I wonder if the OCB is using journalists from Europe, the Middle East and Latin America because they are thought to draw less attention in Cuba than stringers from Miami. Or is the use of foreign journalists an attempt to shape international opinion?